I despair of inkjet printers, although I have found HP better than the current Epson all-in-one scanner/printer we have. Over the weekend my wife wanted to copy a single black and white document. The copy came out streaky so she initiated a nozzle cleaning sequence, which made matters worse and despite claiming to have a half full black cartridge the print faded even more. 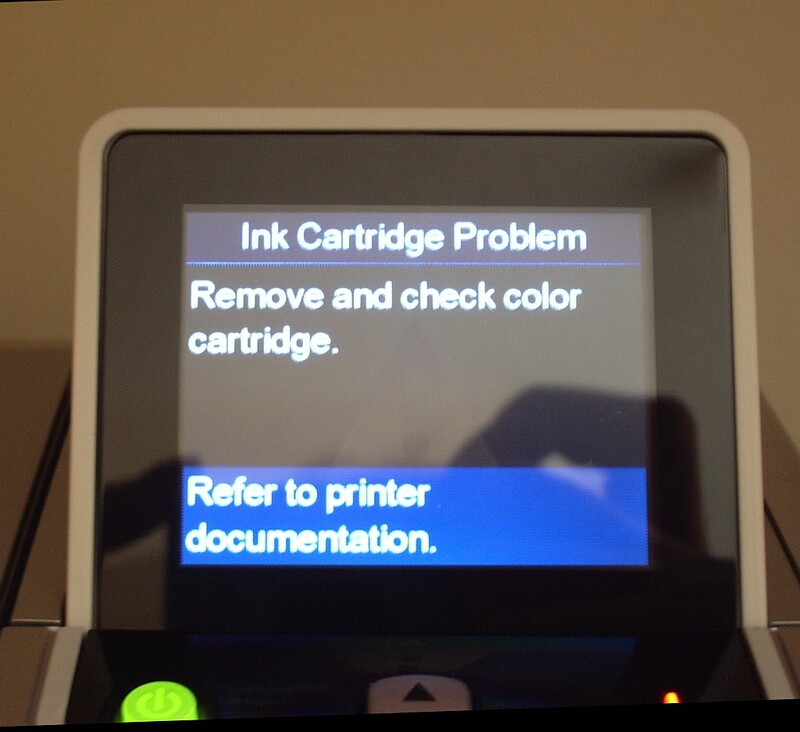 Then a message came from the printer that it "Could not recognise" the magenta cartridge. Despite the fact that the copy required was black and white, it would do no more work until I replaced the cartridge. I then tried the nozzle check again - black was still not working properly so I tried a another new cartridge (luckily we have a few spares). Bear in mind at this point that replacing a cartridge takes about 3-4 minutes as it has to do its little dance and then "charge" the ink. After several nozzle checking and cleaning iterations the ink started coming through, only for it then to tell me that the yellow cartridge was "unrecognised" and it refused to continue until I replaced it. So, onto my 3rd cartridge replacement to print a single B&W document. How things have improved. I think really what's happened is that they have got too clever for their own good and they "know" how many prinouts you should get from each cartridge. Certainly Epson printers seem to be sold at cost in order that you pay several times over for the ink. I've heard the same comment made about Lexmark printers too. Got so fed up with the high cost of Lexmark Inkjet cartridges and the amount they printed. I moved to a Brother Laser printer, 2 yrs on, still on the same toner cartridge it came with, never looked back, brilliant piece of kit. 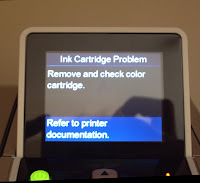 I feel your pain with your inkjet printer. We have had a couple and they have been no end of frustration. My wife purchased a Lexmark colour all-in one some time ago so that our grandson could work on a project for school. After than it sat virtually unused for quite some time and just recently she wanted to print some items with it. Of course it did work, even after trying two new sets of ink cartridges at considerable expense. I have since bought her a Samsung 356 WIFI enable colour laser printer and am quite confident that it will last a considerable length of time. Of all the printer types, dot matrix (yes, can still be found) are the least expensive to operate with respect to consumables (i.e. ribbons), laser printers are next in line and ink jet are way at the high end of scale. Laser cartridges may seem costly but they will print more and in the end are less expensive than ink cartridges.